Exchange traded products (ETPs), which include exchange traded funds (ETFs), exchange traded notes (ETNs) and exchange traded vehicles (ETVs), are one of the fastest growing investment products in the world. Their ability to combine the simplicity of stocks with the diversified risk of mutual funds continues to make them attractive to investors. 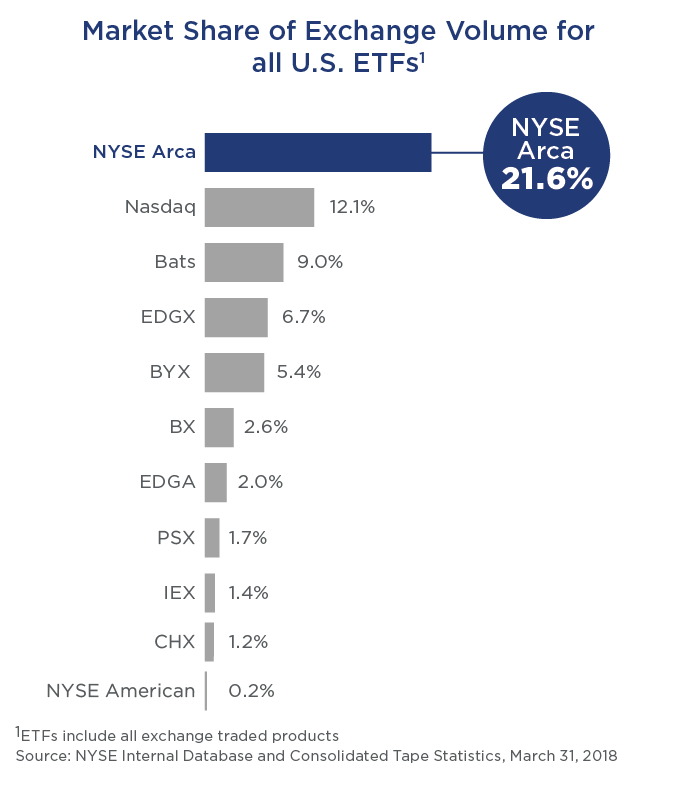 So attractive, in fact, that in 2016 nearly half of the 250+ new ETFs1 listed were listed on NYSE Arca. NYSE Arca is the #1 exchange in ETF volume and listings, offering unparalleled market quality, liquidity and execution from one of the world's most recognizable financial brands. For issuers, we provide end-to-end service from idea inception, to index development and calculation services, to product listing and trading. For liquidity providers, we offer a robust trading platform and enhanced market making programs that support our exchange position as the deepest source of ETF liquidity. Ready to List an ETF With NYSE Arca? Find out what ETF Leaders shared about their funds, companies, industries and strategies when they came to NYSE to ring the bell. 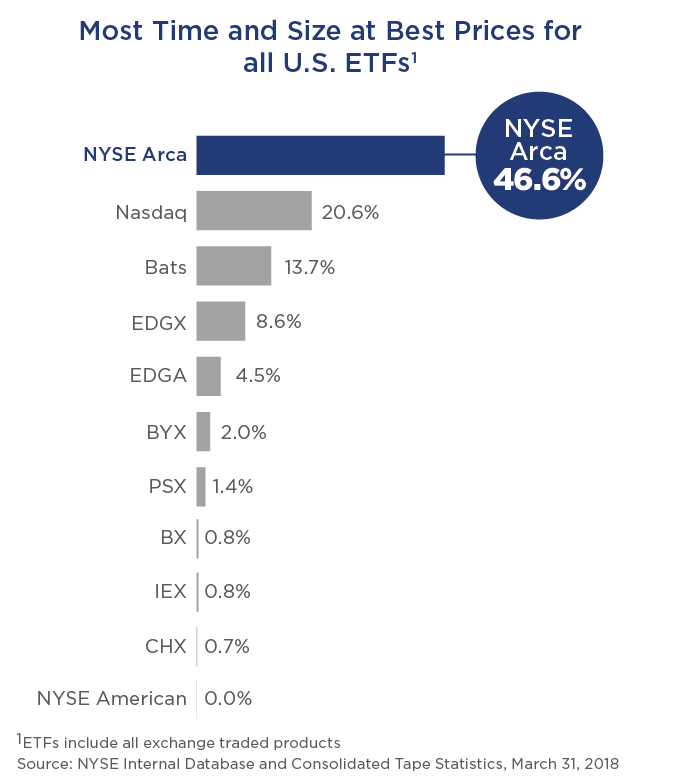 NYSE Arca has become the leading U.S. exchange for ETFs. We listed our first ETF in 2000 and, since then, we've launched the world's first ETV and the first ever commodity-based ETF, and were the first exchange to enhance our generic ETF listings standards to include international and fixed income products. 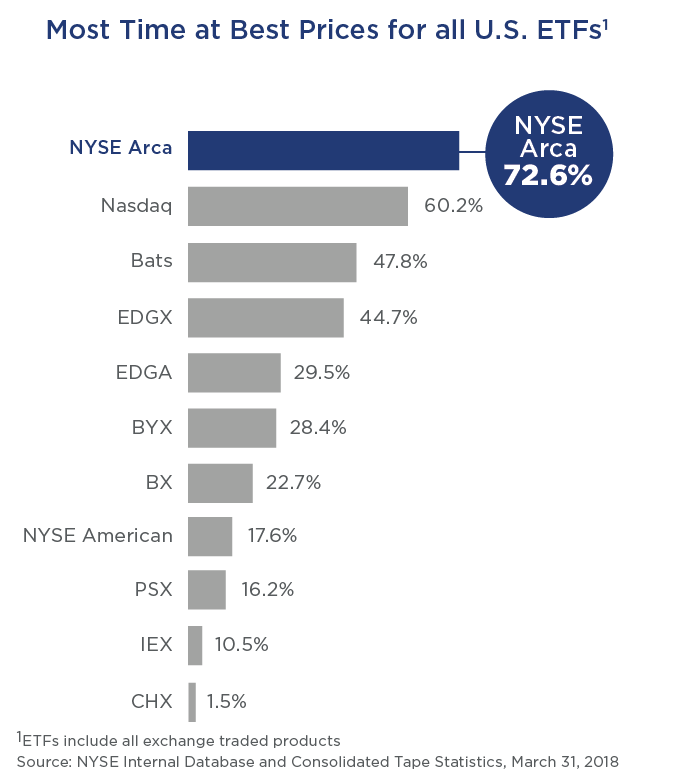 NYSE Arca has the most market share in trading volume with nearly 2.5 times more liquidity than the next largest exchange. 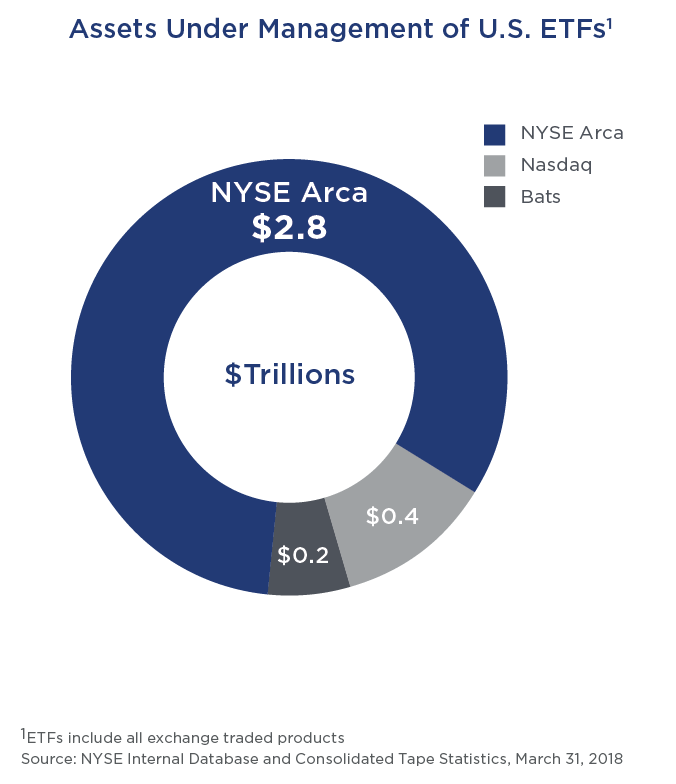 NYSE Arca has over 3 times more listings than all other U.S. exchanges combined. Over 92% of all U.S. ETF AUM is listed on NYSE Arca. NYSE Arca has the narrowest quoted bid / ask spreads. NYSE Arca is at the best price (NBBO) 36% more often than any other exchange throughout the day. NYSE Arca is at the best price with the greatest size over 2 times longer than any other exchange throughout the day. An overview of Amendment 12 with implementation scheduled for Q3 2017. 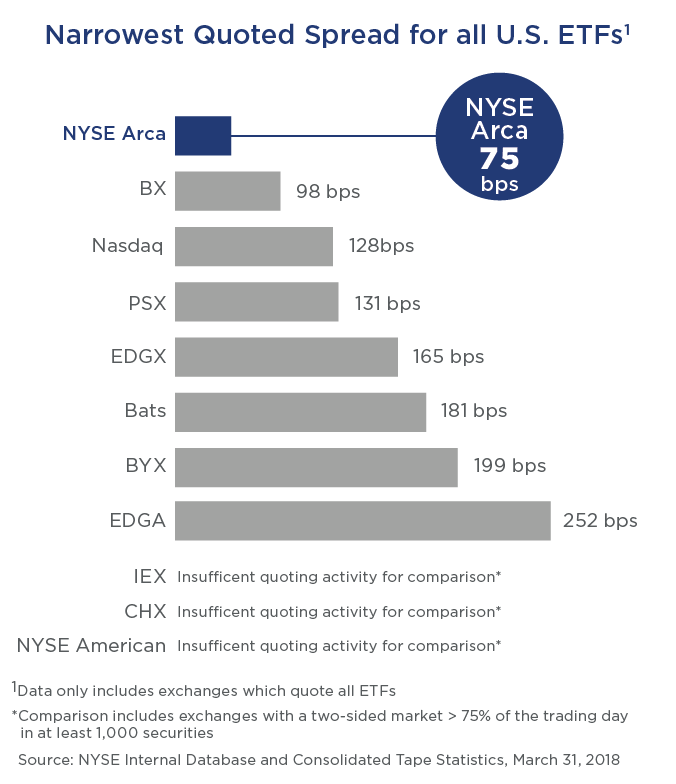 NYSE Arca is the leading exchange in the U.S. for ETFs. A snapshot of ETF market share and performance. The Limit Up/Limit Down (LULD) plan is designed to prevent trades in individual stocks from occurring outside of specified price bands. 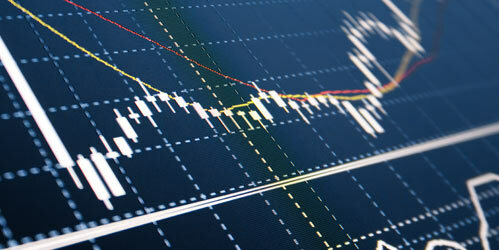 Our volatility-management procedures including Limit Up-Limit Down (LULD) and cross-market trading halts. 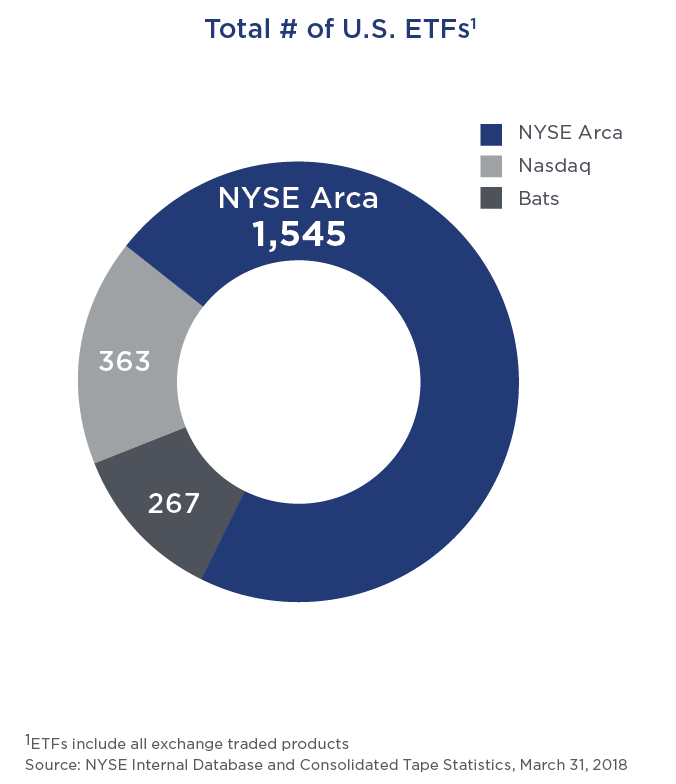 Everything you need to know about NYSE Arca's opening and closing auctions. How we handle "clearly erroneous" transactions and monitor / address aberrant trades. See the benefits of NYSE Arca's market making programs and how you can get started. 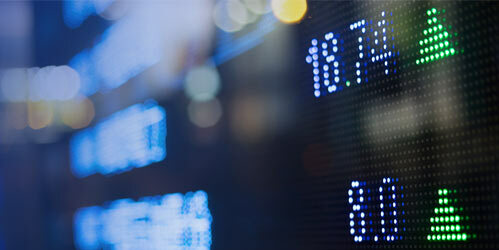 Contact information for Exchange Traded Products and indexes. Search for press releases from the past ten years by category.